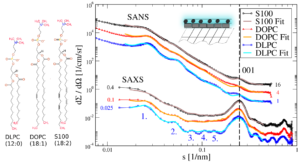 By evaluating synchrotron and lab based SAXS data simultaneously with SANS patterns we study the structure of organic colloidal dispersions like vesicles (cf. Fig. 1), micelles, suspensions and emulsions. As further tools to characterize the structure of colloids, we use micro-calorimetry (µDSC), cryo- and freeze-fracture-TEM, and photon correlation spectroscopy (PCS). Fig. 1: SAXS (blue) and SANS (red) pattern of multilamellar DMPC vesicles (5 wt%, in D2O), prepared by membrane extrusion. The corresponding fits (cyan, orange) are obtained with a bilayer model (cf. inset) that respects the different scattering length densities for the DMPC head groups and acyl chains. 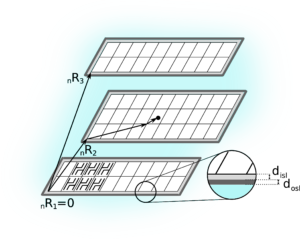 Furthermore a structure factor is included, that respects the repeat units of the bilayers and their number. In recent years, the bottom-up production of organic nanoparticles by means of precipitation, for example for the production of crystalline nanosuspensions of poorly water soluble pharmaceutical ingredients, has gained in importance. This approach is of special interest because it does not include the application of extremely high mechanical energy on the system in contrast to high pressure homogenization. In the antisolvent precipitation method, the hydrophobic target material dissolved in an organic solvent is mixed with an aqueous phase, whereby particles in the sub-micron range start to form. In order to establish suited nanoparticle systems for pharmaceutical or industrial applications, the ability to understand and to control the particle properties such as size, shape and, in particular, the stability is fundamental. As the formation process and the stabilization of nanodispersions produced by this method are so far not well understood, extensive investigations on this field are crucial. In particular, the determination of the molecular structure within the interface between nanoparticles and the dispersion medium, so to say the stabilizer layer, is a prerequisite which could recently be revealed by the combination of small-angle X-ray and neutron scattering (SAXS, SANS) studies, and represents a powerful tool for the characterization of the organic nanoparticles. 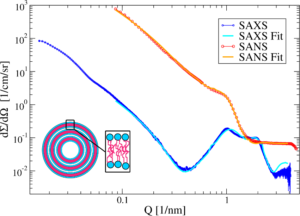 In situ SAXS and SANS combined with the stopped-flow technique are used to study the formation kinetics and the growth of the organic nanoparticles during the very first milliseconds. The combination of these methods yields the opportunity to reveal the role of different surfactants during the formation process and to distinguish between nucleation, growth and agglomeration. 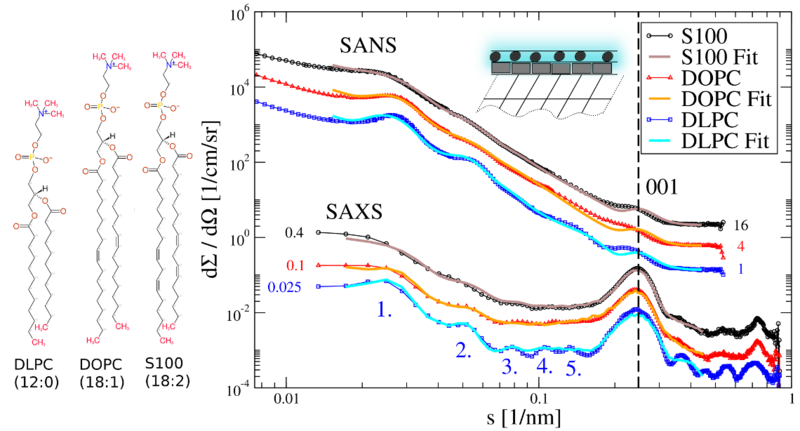 Further, the structure of the final nanodispersions is characterized by photon correlation spectroscopy (PCS), differential scanning calorimetry (DSC) and combined SAXS and SANS studies, whereby special focus lies on the determination of the stabilizer layer. Moreover, the impact of the preparation method on the organic nanoparticles and the stabilization is investigated in this context. Our focus for the study of suspensions and emulsions is on dispersions of triglyceride and medium chain alkanes which are stabilized by lecithins and appropriate costabilizers. Triglyceride dispersions are of interest in the context of drug delivery systems for water-insoluble drugs but also in food science. In particular we focus on the question how the stabilizer molecules arrange at the interface between the liquid or solid core of the nanoparticles. Studying the structure of the stabilizer layer may help to understand and improve the stability of the dispersions, the confinement of drugs and other active substances in the lipid core, and the adsorption of molecules like proteins and polyelectrolytes at the interface. Fig. 2: Structural model for the simulation of suspensions of crystalline nanoparticles. As depicted also assemblies of several nanocrystals can be included. Furthermore in the present model the particles may be covered by up to two layers that can describe for example a stabilizer layer of lecithin molecules with its acyl chains in the inner shell and phosphocholine headgroup in the outer shell. The triglyceride and alkane suspensions consist of rather plateletlike (or rather thin cylindrical) nanocrystals of different aspect ratios. Because of the long c-spacing of the triglyceride and alkane unit cells and the small thickness of the particles a broadened 001 Bragg peak can be observed in the small angle scattering patterns. Interface properties like the thicknesses of the stabilizer shell and the density of the stabilizer molecules in the shell affect the position and the shape of the 001 Bragg peak and thus the 001 Bragg peak can be considered as a key feature in the patterns to study the interface properties. Fig. 3: SAXS and SANS patterns for tripalmitin suspensions (10 wt%, in D2O) stabilized by three different lecithins, DLPC (12:0), DOPC (18:1) and the purified soybean lecithin S100 what is blend of mostly unsaturated 18:x lecithins (mainly 18:2). Furthermore, the simultaneous fits to the SAXS and SANS patterns with the XPPSA method are shown. 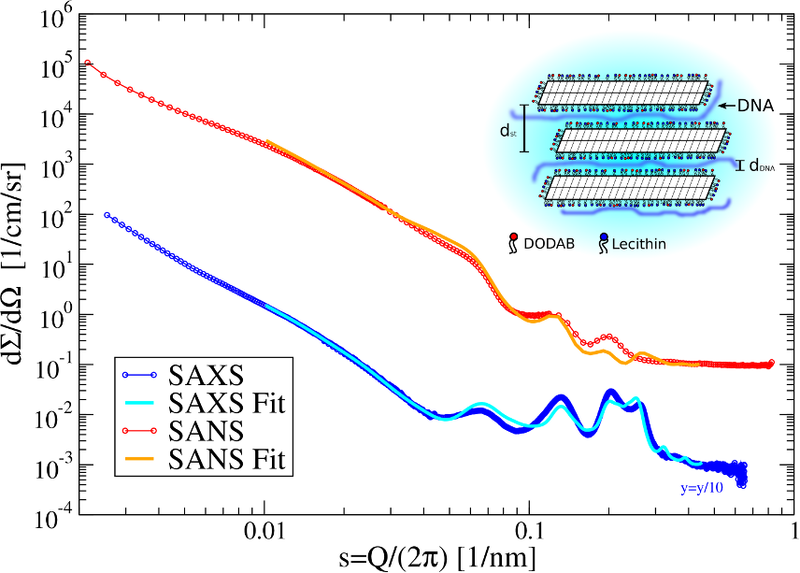 A detailed analysis of the SAXS, SANS patterns and micro-calorimetric and PCS data reveals that the platelets in the suspension prepared with DLPC are significantly thinner and possess slightly larger diameters than those with DOPC and S100. The larger aspect ratio of the DLPC stabilized platelets promotes that a larger number of them self assembles in stacks than for DOPC and S100. In the SAXS and SANS patterns this can be observed by the much stronger stack-related interference maxima at low scattering angles. They correspond to repetition units of about 40 nm for the platelets in the stacks. The fits were carried out with a particular model for the structural arrangement of the lecithin molecules as it is depicted in the inset. Hereby, the acyl chains fully occupy the inner shell with a thickness of about 0.8 nm while the headgroups and additional water fill the outer shell with thickness of 0.4 nm. Thus both the chains and the head groups arrange rather flatly at the interface between the triglyceride core and the aqueous phase. With the help of the neutron and X-ray Powder Pattern Simulation Analysis (NXPPSA) method it is possible to simulate and fit the SAXS and SANS patterns to distinct structural models (cf. Fig. 2). In particular it is possible to fit the scattering length densities and thicknesses of the stabilizer shell and to obtain a volume weighted distribution of the platelet thicknesses. 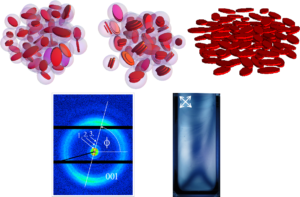 Small angle scattering can be used to study the self-assembly behavior and the formation of a nematic liquid-crystalline phase in such suspensions of plateletlike nanoparticles. At sufficiently high concentrations the platelets start to self-assemble in stacks since it is entropically more favorable that only a fraction the platelets (in the stacks) loose their rotational entropy in favor of the remaining single platelets. 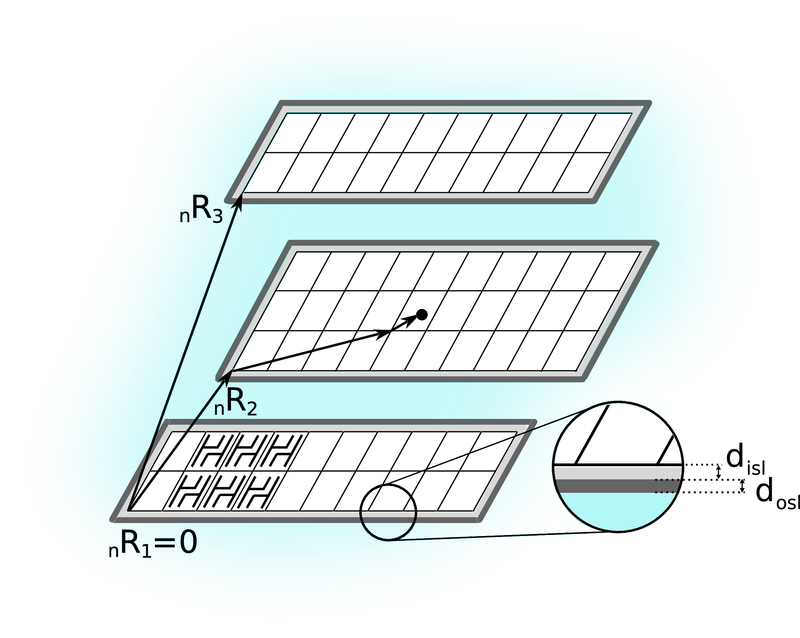 However, at even higher concentrations the higher packing density of the stacks is not enough anymore and the platelet stacks and remaining single platelets start to arrange with a preferential orientation in the suspensions, i.e. liquid crystalline domains form. This results in a anisotropy in the 2D SAXS patterns (cf. Fig. 4). Fig. 4. Densest packing of the exclusion volumes of single platelets at a critical tripalmitin concentration of about 4 wt% (top left). Above the critical concentration the platelets start to self-assemble in stacks (top middle). At even higher concentrations a fraction of the platelets and platelets stacks start to align with a preferential orientation leading to liquid-crystalline domains with a nematic order (top right). 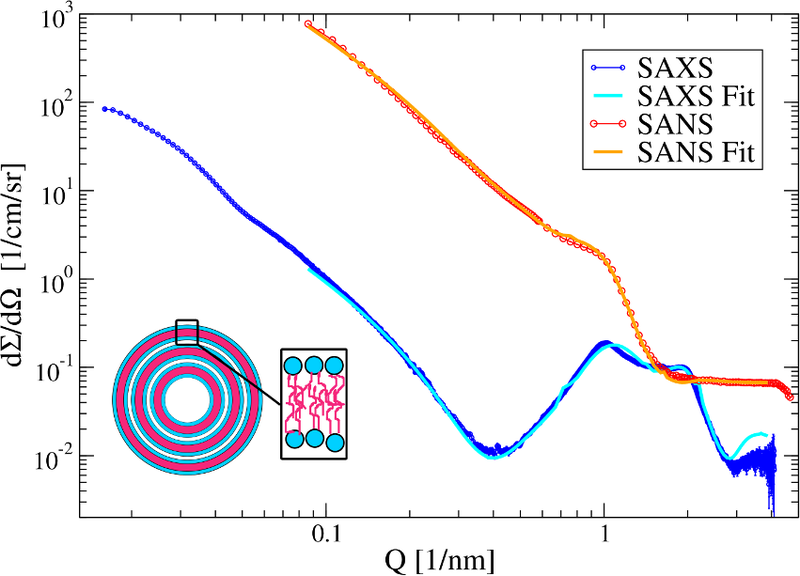 In the 2D SAXS patterns (bottom left) this leads to an anisotropic distribution of the scattered intensity along the 001 Bragg powder ring and the stack-related interference maxima (labeled with 1., 2. and 3.). Furthermore, when viewed under crossed polarizers the samples show a clear birefringence (bottom right). Another main topic of the group is the study DNA-complexes of cationically modified triglyceride nanoparticles (cf. Fig. 5). From a detailed combined analysis of SAXS and SANS patterns it can be concluded that the platelets form stacks with the DNA most probably being located between the platelet-like shaped particles. In contrast to the native suspensions, the stack formation is not entropically driven and is due to the electrostatic attraction between the cationic platelets and the anionic DNA. Consequently such stacks can be observed already at very low concentrations in contrast to e.g. native triglyceride nanosuspensions. 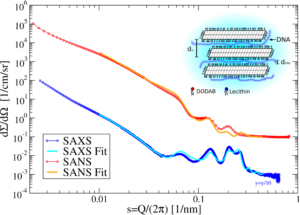 Using the NXPPSA method it possible to reproduce the SAXS and SANS patterns of these complexes and to study the adsorption of DNA at the interface of the platelets. Fig. 5: SAXS and SANS patterns for DNA complexes with cationic tripalmitin platelets (3 wt% tripalmitin, in D2O) . The native suspension of cationically modified tripalmitin platelets (10 wt% tripalmitin) was prepared with a mixture of three stabilizers S100, Poloxamer 188 and the cationic surfactant DODAB. DNA and D2O were added to reach the final concentration and a charge balance between the cationic DODAB molecules and the anionic DNA. In contrast to the stacks of self-assembled platelets that are observed at sufficiently high concentrations in the native suspensions, the adsorbed DNA promotes the formation of stacks via electrostatic attractions for tripalmitin concentrations as low as 1 wt%. Furthermore the mean repetition units (11-15.5 nm) are significantly lower and correspond to the mean thicknesses of the platelets. In these stacks the platelets pile up in direct contact along their (001) faces, with the DNA most probably being intercalated in between (cf. Inset). For the simulation and XPPSA fits for the patterns stacks consisting of 2-4 platelets with a thickness of 3 unit cells tripalmitin were used.